The Spongiophytaceae an artificial taxon used to include a variety of enigmatic early organisms, some of which may represent or be related to vascular land plants (Krausel, 1954; Krausel and Venkatachala, 1966). Some organisms included in this family show features of vascular plants, but not all; as a result, they are sometimes interpreted as depicting transitional stages in the evolution of true vascular land plants. Spongiophyton is a thalloid fossil that has been reported from numerous Devonian localities throughout the world (Krausel, 1954; Krausel and Venkatachala, 1966; Boureau and Pons, 1973; Chaloner et al., 1974; Zdebska, 1978; Gensel et al., 1991; Guerra-Sommer, 1993; Griffing et al., 2000), and has variously been interpreted as a colonial animal, alga, vascular plant, and bryophyte. Specimens are small (25 mm wide by 2.5 cm long), branched axes with rounded tips (FIG. 6.14). It has been suggested that Spongiophyton grew in a desiccating environment, based on the presence on one surface of the thallus of circular pores ranging 200-300 pm in diameter; these have been compared to the pores in certain modern liverworts like Marchantia (FIG. 6.13). The pores are believed to have functioned in gas exchange, and perhaps represent a transitional stage in the evolution of stomata (Chaloner et al., 1974). Additional support for life in a desiccating environment is the presence of a cuticle (or cuticlelike surface layer) covering the Spongiophyton thallus. 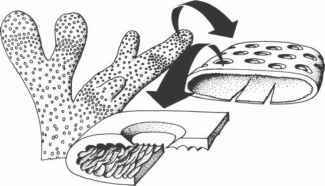 On the thallus surface which contains the pores, the cuticle is approximately three times thicker than on the non-poral surface (FIG. 6.14). Nothing is known about the internal tissues nor the reproductive organs of this organism, although it has been suggested that perhaps there was a hyphal network like that found in certain lichens (Stein et al., 1993; Taylor, W. A. et al., 2004). The lichen hypothesis was initially supported by carbon isotope ratios from Spongiophyton (Jahren et al., 2003). Fletcher et al. (2004), however, found that the range of 613C values in Spongiophyton is not significantly different from those of lichens, liverworts, or mosses, so carbon isotopes are not useful in identifying this fossil. As a result, the affinities of Spongiophyton remain conjectural. Continued research is needed to clarify whether this organism possesses a complement of features that are intermediate between algae and land plants. rings. In a few specimens, spores occur in the cortex of the axes and range from 150 to 190 pm in diameter. Fungi have been reported on cuticles of Orestovia, but the nature of these remains equivocal. Further analysis of the structure of the cuticle and stomata prompted Gensel and Johnson (1994) to suggest that Orestovia is a tracheophyte of uncertain affinity. Snigirevskaya and Nadler (1994) reconstructed Orestovia as a semiaquatic plant resembling the extant marsileaceous fern Pilularia globulifera in overall appearance, with creeping rhizomes and naked orthotropous axes that display circinate vernation when immature. Aculeophyton is a third genus assigned to the Spongiophytaceae by Krausel and Venkatachala (1966). It comes from the Lower Devonian of Siberia and differs from Orestovia in that the surface of the axes is covered by massive, conical papillae.